WILD Skincare is a collection of luxury skincare created for adventurous, environmentally conscious men and women. The collection currently includes moisturizers, face wash and a body wash created from plants and botanicals that are native to and were traditionally used by First Nations of Northwestern B.C. We are proudly working towards harvesting 100% of our botanicals from the Great Bear Rainforest in Northwestern B.C., Canada. We are passionate about supporting our local community by creating jobs, sharing stories and honouring Frist Nations tradition by learning, supporting and creating environmental awareness of this amazing part of the world through our product line. Recycling isn't the most festive thing to be talking about right now, but it's super important to us here at WILD and we think any time is a good time to be talking about recycling and the impact of waste on our planet. WILD is doing it's best to reduce our impact on the planet and reduce the amount of waste in our packaging, read along to learn how and why! “Garbage” does not exist in nature. In a natural system, any waste generated by one organism becomes a useful input to another. For example, a fox’s droppings may fertilize a nearby berry bush whose fruit may then become food for a bird. The bird might then become a meal for the fox, continuing the cycle. Any outputs generated in the system are utilized, and nothing is left to waste. With the creation of synthetic materials, humans have broken this natural, cyclical harmony. While plastics and other man-made materials have allowed us greater and more cost-effective innovative freedom, when they reach the end of their life they become useless garbage that has no place in nature’s healthy cycle of input and output. We see fish with bellies full of plastic and birds making nests from cigarette butts, and the problem is only exacerbated with our tendency to over-consume. Easy and cheap access to so many goods and products, coupled with a dramatic increase in global population and a throwaway consumer culture have resulted in a global garbage crisis. Over the past 100 years, the amount of waste that humanity produces has increased by almost 10,000 percent. Of that staggering volume, it is estimated that 25 percent ends up in our oceans, forming five gigantic gyres of garbage. Since only a small percentage gets recycled the majority is effectively mummified in landfills, leaching out methane and other toxic outputs over time. If it is not buried, it is typically burned in incinerators. While a very small percentage of incinerators do produce some energy as an output, in the process they also destroy all possible value except the caloric (or energy) value inherent in the materials." At WILD, we've be working hard to design a recycling program for ourselves; where we want to be and how we want to get there. Our bottles are glass. We thought that this was the best choice for packaging for us as a start-up. It's not cheap, but it can be recycled over and over and made into new glass products which is really great! So our glass bottles can be recycled at your local recycling center, but what about our lotion pumps? Throughout our research, we discovered that recycling lotion pumps isn't an easy thing, but luckily, TerraCycle offers a great program for them! We've joined forces with TerraCycle to offer you a recycling initiative, so you can recycle your used WILD lotion pumps and get a little reward from us for doing so! Once you're finished with your skincare, and have two empty Wild product bottles, email us and we'll send along a prepaid envelope for your used pumps, along with a discount code for your next order. Pop them into the mail and we then send them off to TerraCycle to be properly recycled!! Easy Peasy! The plastics issue really came to life for our resident photographer Talon this past summer when he worked with Rugged Coast Research mapping the plastics that are washing onto the beaches all over the coast. He said the sheer volume of plastic waste was hard to believe! Read more on his blog here. Just recently we heard from Nicole Robinson and Archie Dundas who spend three months each year living on Rennison Island monitoring marine activity in Caamano Sound. One of the areas they monitor is the Moore Islands. Over three years time the plastic waste has grown from a foot deep to three feet deep, and it's primarily micro-plastics! This is so crazy!!! The most pro-active thing we can do is ensure that we minimize our use of plastics. We can refuse plastic bags, straws and Styrofoam take-out containers, use our own water bottles instead of buying bottled water and be really aware of the plastic products that we use and where they end up at the end of the day! Let's use our imaginations, get involved and be proactive!! Walking through the forest I had a realization that everything around me was alive…. breathing… participating actively in producing CO2. I felt like I was in the engine of the planet. It was a moment that gave me pause. I also considered my daily trek back and forth from my work in downtown Vancouver. I always walked to my apartment in Yaletown; about 20 minutes down Burrard with a left onto Davie. I loved the walk, but deep down I was always concerned about breathing in the carbon monoxide from the traffic. Standing in the forest and considering its smell, I realized just how primal it is. It’s an olfactory cacophony that melds together all of the distinct scents from the myriad of plants, animals, mushrooms, moss, lichen and salt air from the ocean, into an oxygen stew. 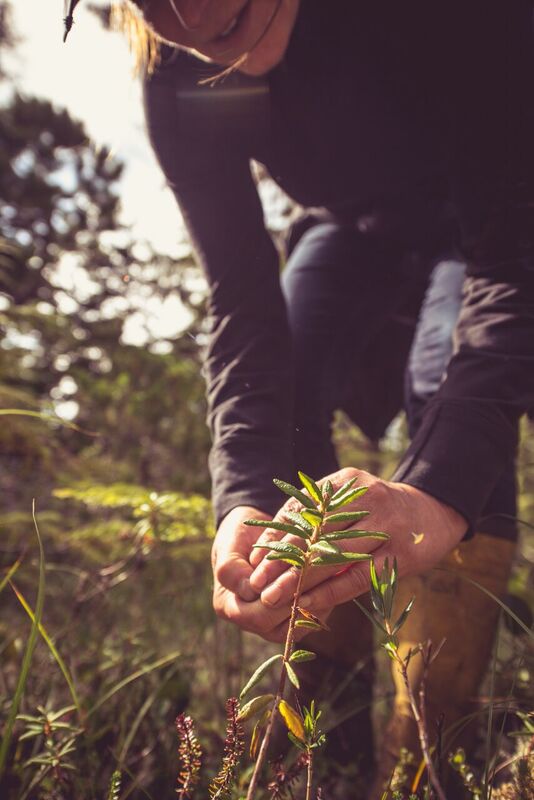 When we made Wild we knew that we had something very special and rare in the form of Labrador Tea which is one of our key ingredients. The shrubs grow in wet, acidic bogs and conifer swamps where peat moss forms puffy tufts amongst the twisted little pines struggling to survive in the bog water. It’s something that not a lot of people are familiar with and it’s not widely used in the skin care industry. It’s packed with tannins, mineral salts and is said to be triple the effectiveness of Vitamin C and Grapeseed Oil in combatting free radicals. It’s an astringent and an anti-microbial as well. Those are great attributes for those of use roaming the streets of our cities! We use it as one of the key ingredients in WILD not only for it’s amazing qualities for skin care, but because of its uniqueness. Labrador Tea has an amazing sweet/spicy smell. When you use Wild products, your mind will search back and try to identify it and try to attach it to a time and an event in your life and you may draw a blank, because you’ve never smelled this plant before! Sherry; our chemist, tempered the scent of the Labrador Tea with a touch of Cedar Leaf and the intertwine of the scents is otherworldly. The body wash and facial cleanser cut loose with that great smell when you lather it on your skin and then it disappears; like a fantastic vacation that ends all too soon. Wild is designed for men and women; the scent is unique but it doesn’t remain on your skin. All that remains is the goodness of the ingredients. Now take a deep breath and imagine you’re in the Coastal Rainforest!!! Talon – one of our founders and resident adventurer recently had an amazing opportunity to do a photo shoot with the Rugged Coast Research Society. Rugged Coast is a new non-profit focused on researching and restoring remote coastal habitats along the B.C. coast….ie how much ocean garbage is getting washed ashore, what is it, what kind of damage is it causing and finding funding for clean-up and removal of the garbage. The 7-man crew spent 5 days working their way along the coast from Port Hardy to north of Rivers Inlet. They accessed remote and often inaccessible shoreline to document the volume and types of garbage, and develop mitigation plans. Unfortunately, the greatest volume of garbage was Styrofoam. Styrofoam is a killer people! It’s a petroleum based product that breaks up into tiny little floating balls that fish and birds gobble up because they think it’s food. Here’s a simple example; you drop a Styrofoam cup on the street, that cup washes down into a storm drain and out into the ocean where it gradually breaks down and never disappears! Dafne from North Pacific Kelp has a great way of being proactive about Styrofoam. If she’s given a drinking cup or a take-out container that's made of Styrofoam, she simply refuses to take it and asks the retailer for a recyclable container. This is one small way that we people here on shore can advocate for a change that will have a positive impact on our oceans! Shout out to the Rugged Coast Research Society for making us aware of what’s happening on our Coast!! I'm in love with Labrador Tea! It's becoming an addictive thing; rain or sun I've been trekking out through the bogs collecting a ROOTS bag of leaves almost every day!!! So what is it about this stuff?? For years - and I'm talking lifetime; I've known about Labrador Tea. I knew about the First Nations people here in Northwest B.C. using it for thousands of years, I knew about the explorers and the history of B.C. and envisioned all of the people who had passed through sitting around campfires brewing Labrador Tea and drinking it from little metal cups like something out of one of Clint Eastwood's "historical" movies. I spent years in the woods - in forestry; slogging around, boots sinking down through the moss & lichen bogs. The Labrador Tea was always there, struggling up through layers of moss and lichen, hiding in the tiny stunted bog Pines and sporting delicate pink flowers mid-summer. When Sherry and I began working together and looking for natural, botanical substitutes to replace the overseas botanicals typical to imported natural and organic skin care products, I hadn't yet grasped the effectiveness of Labrador Tea, and the amazing attributes it presents for skin care. It's really unbelievably incredible! ( The plants and botanicals section of the website talk about this so I won't rant on here.) This delicate, tough, furry little survivor does things that no other plant can do for your skin! The big drawback is that it has a really low yield of essential oil when it's distilled! Each day I sustainably harvest about 2 litres/ 2 quarts of leaves and distill them. I get roughly the size/width of one and a half nickels ( best comparative I could come up with). That's not much considering how much we actually need for the product run! Fortunately the Labrador Tea that grows on Haida Gwaii has much bigger leaves, so the yield is a bit better and I'll have Dafne and her crew at North Pacific Kelp helping - no more aching back!!! OMG!!! The rain just stopped!!! I'd better head out and grab this moment in the brighter shade of gray skies!! I'm counting the days to the HAIDA GWAII HARVEST!!! I ( Karen) have just driven for 3 days to get from Vancouver to Prince Rupert and begin harvesting Labrador tea! I timed my drive really badly and came to a blocked highway at Spences Bridge due to the forest fires in the B.C. Interior. I drove to Merritt and couldn't find a hotel room so I drove back to Hope expecting that the highway would be open in the morning and that I'd be able to head back North as planned! Turns out that the forest fires have and are still creating unimaginable turmoil in the Caribou. The news is that 14,000 people have been evacuated from the area, homes and businesses have been destroyed and the fires are still out of control. I ended up driving East, all the way to a town called Tete Jaune Cache, near the Alberta town of Jasper and then turning West to drive on to Prince George and ultimately Prince Rupert. it took a day longer that it should have, but I got to see an area of B.C. that I haven't visited before. The smoke throughout the drive was insane. It was literally like driving through one giant camping fire. The air was thick with smoke- almost like the coastal fog; and breathing all of that smoke in probably wasn't very healthy! I arrived in Prince Rupert in the rain, it's still raining and I'm back into my mohair socks, Sherpa boots and lots of layers as it's pretty chilly - good bye suntan! Upside.... everything, absolutely everything is green, green green. I had forgotten just how many shades of green there are here!! Today I'm going to get all of my rain gear on and start harvesting!! Tonight I'll have the distiller on and we'll have the start of the 2017 Labrador Tea oil! I think there's a great Cab Sav that will be perfect to celebrate Day 1 !!!! We are getting soooo close, two weeks to go!!! Finally!!! This has taken such a long time, but doing it right has been really important to us! We've been working on this since 2012 believe it or not. The story is probably typical to any story of any start-up..... the vision, the boot-strapping, hanging in there, all of the hard stuff that we all do to build the vision and get to the point where it's real and ready to step out into the world! The magical thing about starting a new business is that at the beginning it's nothing more than a little idea, a thought that hits one day and maybe the thought sticks and gradually grows little roots in your mind and one day you say, "Yeah, I have to go for this! This is a great idea! This can be exciting and meaningful - life changing!" We decided that it would be great to have a design on the label from an emerging First Nations artist in the Northwest area. A friend of a friend of a friend introduced me to Todd Stephens who is a really amazing guy. "The salmon represent the two sides that people are taking with regards to the LNG plant proposed for Lelu Island. The one side which says we shouldn't build there because it isn't a very smart ecological decision to build there. Then the other side which states that there are no risks involved when building on that site and that the economic benefits f=that are generated from building this plant are far too great to pass up on." "Both sides are fighting for survival. Both sides feel that they're in the right. Both sides speak from their perspectives." Right now our graphic designer Diego is working on vectoring Todd's work and placing it on the new labels - very exciting!!!!! Pulling WILD together is crazy complicated, which is why we're so late launching! Talon and I were really fortunate to be able to spend a day at Lelu Island, situated where the wild Skeena River meets the Pacific Ocean. Lelu Island is slated to be blasted flat for a huge liquefied natural gas facility and a group of Tsimshian First Nations and others who understand what a poorly thought out idea this is have been protecting the island for over a year now. Lelu Island is attached to an area called Flora Bank. It's located at the mouth of the Skeena River and each spring millions of salmon come down the Skeena River and congregate in the eel grass beds at Flora Bank area. This is where they adjust from living in freshwater to sea water. The smoltification process takes a lot of energy and causes them to be less active. The eel grass beds provide both food and shelter from predators while they prepare to head out into the Pacific. We spent an amazing day there touring the area by boat and then trekking around the island. We collected Labrador Tea in the deep mossy muskeg beds with Christie and Patty. I honestly had one of the best, most peaceful days that I've had in a long time at Lelu! Bladderwrack Seaweed and eel grass! Copyright © 2015. Wild Skin Care. All Rights Reserved.